Along with 60 acres of peaches that range across 15 different varieties, we also farm seven acres of 50-year-old Yellow and Red Bartlet Pear trees. 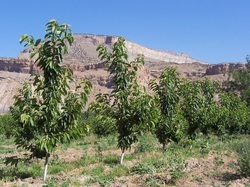 We've also grown three acres of sweet cherries since 2006. We take pride in growing the highest quality fruit at the most reasonable price to our customers.